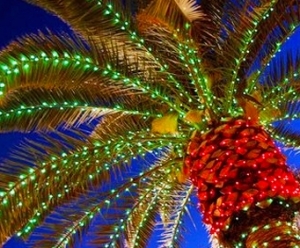 December 3-4, 10-11, 16, 17 & 18, 2010 From 3 – 10 p.m.
See Brookgreen Gardens come to life amid the soft glow of more than 5,000 hand-lit candles and thousands of sparkling lights. Walk the paths with a warm cup of cider, hear the sounds of hand bells ringing, Dickens carolers singing, and celebrate the season with family and friends. Click here to view a slide show from last year’s event. Purchase Nights of a Thousand Candles tickets early and receive a 20% discount on adult admission! We are experiencing some technical difficulties with our online ticket system at the present time and believe tickets will be available online again soon. Please check back for updates. You may purchase tickets now at Brookgreen’s admission plaza, Wall Lowcountry Center, or by calling (843) 235-6016 during normal business hours. Until November 30, discounted adult tickets (ages 13 and up) are $12 and child tickets (ages 4-12) are $6. Individual and Family Members of Brookgreen Gardens discounted adult tickets are $8 and $4 for children. Children age three and under are free. There is a $2 processing fee to mail tickets and orders must be received by November 24. If you are a member of The Huntington Society, the Chairman’s Council or the President’s Council, please call (843) 235-6016 or go online to order your tickets. In December, adult tickets are $15 and tickets for children are $6. Individual and Family Members adult tickets are $10 and tickets for children are $4. All children age three and under are free. All Nights of a Thousand Candles tickets are non-refundable and considered a donation to Brookgreen in the event of inclement weather. Push type child and adult strollers are complimentary and available on a first-come, first-served basis. Enjoy the sights and sounds of nightly entertainment performances. Click here for the performance schedule. See two beautiful indoor exhibits, Signs of the Season in Flora and Fauna – evergreen trees, wreaths, and plaques decorated with assorted natural materials, along with vintage carousel animal figures add beauty to this exhibit. Displaying collections of sculpture, paintings, Christmas trees, and old-fashioned holiday décor, Signs of the Season in Art and History reflects the festive celebrations and pastimes of the winter season from the late 19th century to the present.